Coconut oil uses make it easy to get silky, smooth, and healthy skin. If you are looking for a multi-tasking natural skin care oil, look no further than coconut oil. Coconut oil is by far one of my favorite natural skin care oils. 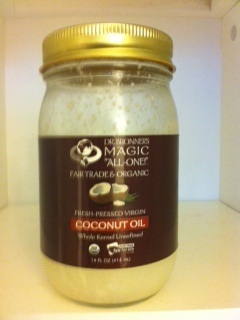 I use it every day as a skin moisturizer, hair conditioner, frizz fighter, make-remover, and health supplement. How's that for multi-tasking? Coconut oil uses and benefits for aging skin have been known for quite some time. You don't need this super secret anti-wrinkle formula to take advantage of coconut oil's benefits for aging skin. Simply applying a small amount of coconut oil to the delicate skin around the eyes helps to reduce and smooth fine lines and wrinkles. Coconut oil has also been reported to help fade skin discolorations. If you are battling age spots, try this: Mix 2 Tablespoons coconut oil, 4 teaspoons castor oil, and 1 ml of vitamin E. Apply to affected skin twice daily. Forget the Carmex The skin softening properties of coconut oil make it the perfect remedy for whatever may ail your lips. To smooth dry, chapped lips try this simple solution. Mix 2 drops of chamomile oil and 2 drops of geranium oil with 1 tablespoon of coconut oil. Massage mixture onto lips. Though one of the lesser known coconut oil uses, it is also effective at getting rid of those unsightly cold sores. The fatty acids found in coconut oil have powerful antimicrobial properties making it effective in killing a broad range of bacteria, viruses, fungi and yeasts. Herpes simplex virus-1 is one of these viruses. For effective cold sore relief, try this coconut oil home remedy: Mix 7 drops of myrrh, tea tree, melissa, or lavender essential oil into 1 tablespoon of coconut oil, and apply to cold sore frequently until gone. If your baby's bottom is red and irritated, try using coconut oil. This natural skin care oil is the perfect home remedy for diaper rash. While one of this lesser known coconut oil uses, it is definitely one of the handiest. The lauric acid in coconut oil is antibacterial, antiviral and anti-inflammatory. This makes coconut oil extremely effective at treating most types of rashes, including diaper rashes. Applying coconut oil at every diaper change can help prevent and relieve diaper rash. In the South Pacific islands, mothers mix a little turmeric powder with coconut oil to treat irritated skin. Coconut oil also provides a safe alternative to conventional baby oils and lotions, and can be massaged onto skin just as you would store bought lotions and oils. One of the traditional coconut oil uses in the tropics is for the hair. If you have dry and brittle hair, coconut oil can help get it silky smooth in no time. In some cases, coconut oil has also been shown to help prevent hair loss. For better hair days, apply a coconut oil conditioning treatment once or twice a week. Your hair will be silky, shiny, and, best of all frizz free! Rub 2 to 3 teaspoons of coconut oil in your hands, and gently massage the oil into your hair until it is well coated. Leave it on for two hours or over night, then wash out. Coconut oil can also replace those expensive, chemical-filled frizz serums. Simply apply a small amount to dry hair to naturally tame frizzies and fly-aways. Coconut oil is the perfect eye make-up remover, and my personal favorite of all the coconut oil uses. Not only will it remove the most stubborn eye-makeup, it softens fine lines and wrinkles while conditioning and strengthening eyelashes. Using coconut oil as a make-up remover is simple. Apply a small amount of coconut oil to the eyelid and lashes with your fingers and wipe off with a dampened cotton pad. Applied topically, coconut oil benefits skin by soothing and helping to speed the healing of minor cuts, scrapes and insect bites. It forms a chemical barrier on the skin to help ward off infection in minor skin abrasions, while it's anti-inflammatory properties provide quick relief for itchy insect bites. For minor abrasions, simply clean and apply a virgin coconut oil saturated bandage to the affected area. Apply oil directly to bug bites for instant itch relief. Coconut oil is a great alternative to expensive and potentially toxic creams and lotions. Using coconut oil daily strengthens the skin and underlying tissues, helping to protect it from injury and promote healing. For silky, smooth skin, apply coconut oil after your shower or bath while skin is still warm and damp. It's just that simple! Pacific Islanders have long used coconut oil to protect their skin from the harsh rays of the hot tropical sun. One of the most important coconut oil uses is its ability to protect the skin and underlying tissues from the damaging effects of excessive UV exposure, including sunburn and cancer. Applying coconut oil to the skin and consuming it in your diet helps strengthen the skin making it more resilient and less prone to sunburn. While it is true that coconut oil has the ability to protect skin from the sun, it is not a replacement for sunscreen. It is always advised that a natural sunscreen be used in addition to coconut oil.